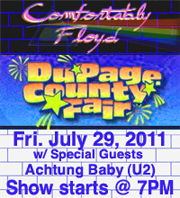 7/29 - Dupage County Fair - Main Stage 9:00PM to 11:00PM. All ages festival in Wheaton. 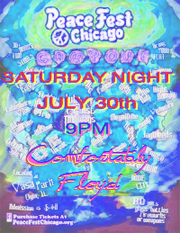 Comfortably Floyd is ready to perform at a festival or club near you. See below for booking contact to book this great show. More show dates to be announced soon. 2010 ABBEY PUB show on 7/31 will be an early show starting at 7:30pm. Illinois anti-smoking laws limit the indoor places we can use fog machines which are required for laser shows. However, some clubs such as Abbey Pub in Chicago allow fog machines. Places like that are where we hope to have our lasers in use. Comfortably Floyd has just finished the full "Animals" album live. Next is the full "The Wall" album live in 2012. So Welcome.... . . . .
LOCAL FESTIVALS $1,200 - $6,500 for 75 minutes to 2.5 hours. Factors affecting the price - length of set, location, event size, level on the bill (headling, opening act, etc. ), level of the light show, staging logistics for multimedia & lasers, and other factors. Typical 2-hour headliner festival shows with lasers and video screen will run $1,750 to $3,500 on average. Discounts for well-promoted events, or opening for for national acts. For example, a 75-minute music-only show opening for, let's just say, Survivor, would be $800. A 2-Hour FESTIVAL or THEATER shows with lasers, video, and a full state-of-the-art light show is $5,000. This requires minimum 24' wide x 20' deep stage with 12'+ high at stage back, and preferrably 18' distance behind the stage for rear video projections. For theater shows, we can accept contracts that guarantee $1,500 + percentage of ticket sales. 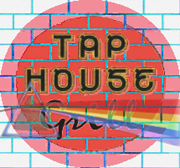 LOCAL PRIVATE PARTIES & BARBEQUES $1,500 + tips with food & drinks for the band. We require a hard & flat performance area minimum of 16'x20', preferably 20'x30. 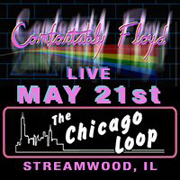 Chicago area LOCAL BARS & CLUBS, contact United Talent Coordinators @ 630-279-7625 to request the band. Outside the immediate metro area, EMAIL or call Bob Schmidt @ 312-320-9687.